Turkey Shape Address Plaque - - wilderness theme turkey silhouette house number sign. Wall mount. Made in USA. This custom-made Turkey Address Sign is perfect for a rural home or business where wild turkeys roam and for city dwellers who are passionate about turkeys, refer to Thanksgiving as Turkey Day, and have dozens of recipes for turkey leftovers. Wall mount 10"W x 11"H turkey silhouette includes one line of personalization. Address number line holds up to four (4) 3" characters or up to three (3) 4" characters. Made from sturdy, non rusting and UV-stabilized laminated acrylic. Characters are permanently engraved into the sign during the production process, not painted on or screened printed. Please choose one of our eight vivid color combinations for your turkey sign: sky blue with white characters; black with white characters; white with black characters; brushed gold with black characters; brushed stainless with black characters; kelley green with white characters; red with white characters; and yellow with black characters. Dimensions: 10"W x 11"H x 1/8". 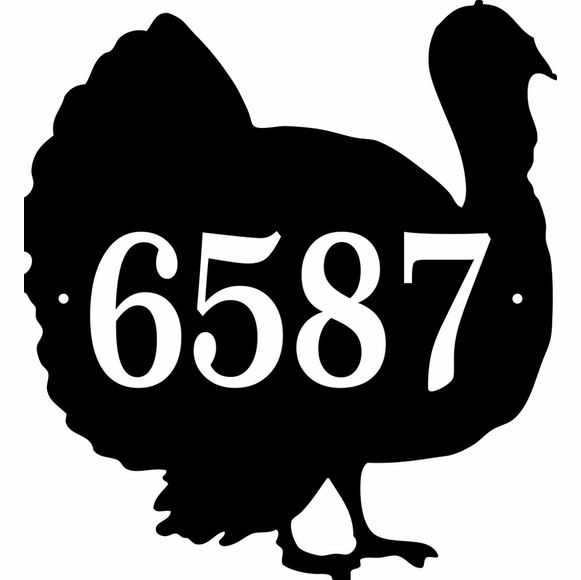 Address sign in the shape of a turkey crafted in the USA. Click links in Related Products to see more special shape novelty signs.